Two children accompany their parents as they travel the world helping animals on the verge of extinction. As their parents work alongside international agencies, the children have their own thrilling adventures. In this book, Joe, his sister Aesha and their parents travel to a remote island in the Philippines to take part in an intriguing seahorse project in a marine protected area. Joe befriends Dario, a local boy, and as they explore the island, Joe unravels the identity of the criminals who've been dynamite fishing and damaging the fragile coral reefs nearby. Exciting snorkelling trips, snapshots of island life and a thrilling chase scene are all featured in an exotic setting. Plenty of information is included on marine life, such as seahorses, mangrove sharks and reef fish. Shadows under the Sea is written with the assistance and guidance of London Zoo's conservation team. All information is accurate and the stories are full of excitement and tension. 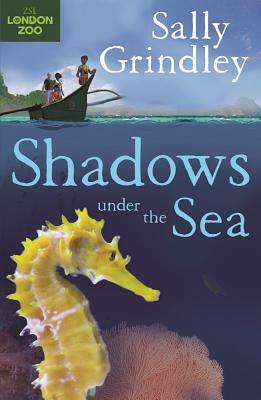 Sally Grindley is the author of bestselling and award-winning fiction for young readers. Here she brings to life a story of intrigue set on a Filipino island.